Problem solving is a critical skill for success in business—in fact it’s often what you are hired and paid to do. 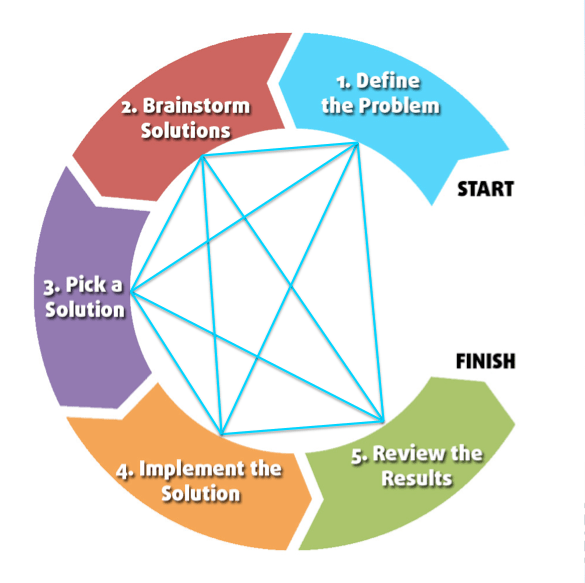 This article explains the five problem solving steps and provides strategies on how to execute each one. Before we talk about the stages of problem solving, it’s important to have a definition of what it is. Let’s look at the two roots of problem solving — problems and solutions. One important call-out is the importance of having a goal. As defined above, the solution may not completely solve problem, but it does meet the goals you establish for treating it–you may not be able to completely resolve the problem (end world hunger), but you can have a goal to help it (reduce the number of starving children by 10%). Let’s explore of these steps in more detail, understanding what it is and the inputs and outputs of each phase. aka What are you trying to solve? In addition to getting clear on what the problem is, defining the problem also establishes a goal for what you want to achieve. Input: something is wrong or something could be improved. Output: a clear definition of the opportunity and a goal for fixing it. aka What are some ways to solve the problem? The goal is to create a list of possible solutions to choose from. The harder the problem, the more solutions you may need. Input: a goal; research of the problem and possible solutions; imagination. Output: pick-list of possible solutions that would achieve the stated goal. aka What are you going to do? The ideal solution is effective (it will meet the goal), efficient (is affordable), and has the fewest side effects (limited consequences from implementation). Input: pick-list of possible solutions; decision-making criteria. Output:decision of what solution you will implement. aka What are you doing? The implementation of a solution requires planning and execution. It’s often iterative, where the focus should be on short implementation cycles with testing and feedback, not trying to get it “perfect” the first time. Input: decision; planning; hard work. Output: resolution to the problem. aka What did you do? To know you successfully solved the problem, it’s important to review what worked, what didn’t and what impact the solution had. It also helps you improve long-term problem solving skills and keeps you from re-inventing the wheel. Input: resolutions; results of the implementation. Output: insights; case-studies; bullets on your resume. Once you understand the five steps of problem solving, you can build your skill level in each one. Often we’re naturally good at a couple of the phases and not as naturally good at others. Some people are great at generating ideas but struggle implementing them. Other people have great execution skills but can’t make decisions on which solutions to use. Knowing the different problem solving steps allows you to work on your weak areas, or team-up with someone who’s strengths complement yours. Want to improve your problem solving skills? Check out our training programs or try these 20 problem solving activities to improve creativity. 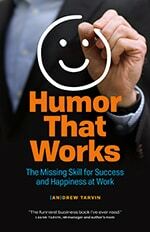 Humor That Works: The Missing Skill for Success and Happiness at Work. Join over 4,000 monthly readers and get a dose of humor delivered to your inbox (plus you’ll receive a free PDF of 50 Ways to Use Humor at Work). I’m writing my 7th edition of Effective Security Management. I would like to use your circular graphic illustration in a new chapter on problem solving. You’re welcome to phone me at — with attribution. Sure thing, shoot us an email at admin@humorthatworks.com. i love your presentation. It’s very clear. I think I would use it in teaching my class problem solving procedures. It is well defined steps, thank you. I like the content of this article, it is really helpful. I would like to know much on how PAID process (i.e. Problem statement, Analyze the problem, Identify likely causes, and Define the actual causes) works in Problem Solving. very useful information on problem solving process.Thank you for the update. It makes sense that a business would want to have an effective problem solving strategy. Things could get bad if they can’t find solutions! I think one of the most important things about problem solving is communication. I teach Professional communication (Speech) and I find the 5 steps to problem solving as described here the best method. Your teacher actually uses 4 steps. The Feedback and decision making are follow up to the actual implementation and solving of the problem. The steps given are very effective. Thank you for the wonderful presentation of the cycle/steps/procedure and their connections. the right from the wrong. 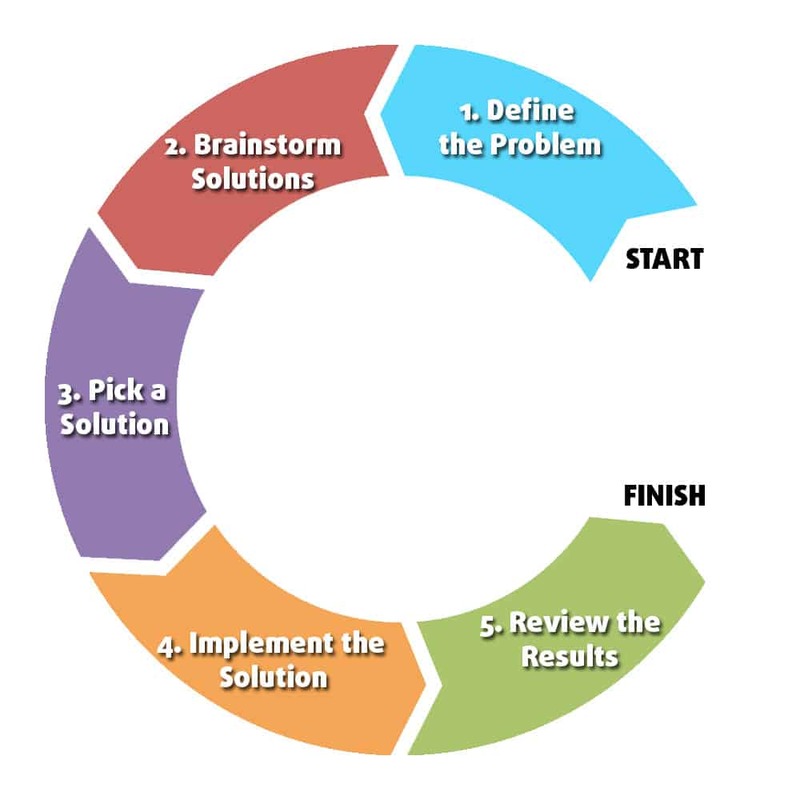 I like the contents of the problem solving steps.